Scene Setup: Hostel of an engineering student. Bhujbal, Sukhilal, champak and Manshuiya are sitting in Manshuiya’s room. Suddenly phone beeps and a message is received saying result declared. They start checking the result. Everyone agrees but Manshuiya (only sober guy in the room). Bhujbal: Dude, we are in hell. I wish I could quit all this engineering and just start writing keep doing it until death. Sukhilal: Same here dude! I wish I could do social work and help the needy. It isn’t like I want to be their ‘messiah’ or something but I just want to help them. 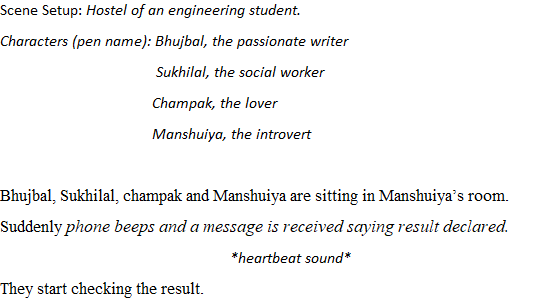 Manshuiya: Hey Bhujbal! If you love writing so much and want to learn more then why don’t you join Whitepanda. You will get a lot to learn and write obviously. I think you should do what you said!!! Manshuiya (Loudly and angrily): Shut Up! Manshuiya: Shut Up! I am the one who is speaking right now, so let me speak. Do not dare to interrupt me. Hey Sukhilal, you want to help the needy, correct? Let me ask you, how will you do this, huh? Being drunk? You want to help needy then quit drinking first and join Jugnoo, an NGO which teaches poor kids for free, and do join it tomorrow because sooner the better. Further, you said something about quitting engineering! You do know that you will need money to do social work, don’t you? 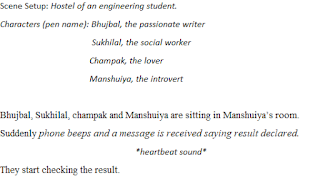 Now Champak, let us talk about you, shall we? So, you don’t have a passion then develop one or make engineering your passion. You are good at it. Additionally, you are better with girls, everyone here knows this. So, why don’t you start using Tinder, the dating app. Who knows, you may find your better half. (All three in monotonous tone) We will do it the first thing tomorrow!